Our family has been very blessed this year by the new middle school religion teacher at St Raphael Catholic School. Mrs. Tarcza has given our middleschoolers the weekly homework of reading the upcoming Sunday mass readings and doing some kind of response on them. 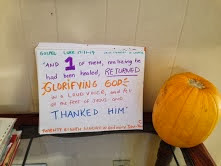 One week the kids were assigned to write their own "homilies." Another week they created a cartoon to express the message. A third week she asked them to make up text messages of the gospel verse or meaning. Since two the our kids have Mrs. Tarcza and have been getting into the Mass readings each week, I have joined them. My own project has been to make a one verse sign that is displayed in our kitchen. My hope is that the whole family can memorize a verse from the gospel, as well as be prepared for mass on Sunday. 28th Sunday in Ordinary Time, Year C Luke 17:11-19 "And one of them, realizing he had been healed, returned glorifying God in a loud voice and fell to the feet of Jesus and thanked Him." 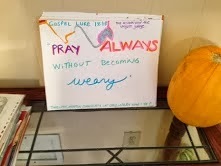 29th Sunday in Ordinary Time, Year C Luke 18:1-8 "Pray always without becoming weary." It is really simple to find the mass readings. Just go to http://www.usccb.org/ On the right side is a calendar and when you click on the upcoming Sunday, it takes you right to the Lectionary readings for that day. Bonus: the colors on the calendar reflect the liturgical year: green is ordinary time, red symbolizes a martyr's feast, white for feasts of angels and saints who are not martyrs. After you find the readings, read through them a couple of times and ask the Lord what He would like your weekly verse to be.Then use any artistic talents you have to hand write, draw, color or print out from the computer that verse. I like to use 1/4 of a poster board about 14" x 11". I am planning to do this for all 52 Sundays of the three year cycle and then use them over and over again. Laudate has all the readings for mass for every day of the year, in both written and podcast form. And they have a daily homily podcast too. Word on Fire is the website (www.wordonfire.org) and app by Fr. Robert Barron, the rector of Mundelein Seminary in Chicago and the creator of the Catholicism project. Fr. Barron is a particularly gifted homilist. Each Thursday he posts his homily for the upcoming Sunday. 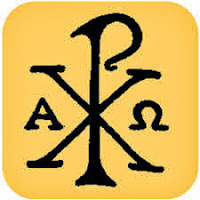 Additional podcasts for Sunday readings include Food for the Journey by Sr. Ann Shields (look up her Friday podcast which comments on the upcoming Sunday readings) and Newman Catholic Campus Ministry by Fr. Michael Schmitz, see http://www.umdcatholic.org/homiliesmain . Fr. Schmitz is the chaplain of the Campus Ministry at the University of Minnesota Duluth.